In their campaigns, Republican candidates for Congress and the presidency were unanimous in denunciations of the Affordable Care Act (ACA) for increasing health insurance premiums and deductibles. Senate Republicans are struggling to pass a plan called the “Better Care Reconciliation Act” (BCRA) that would increase premiums and deductibles even higher than those currently paid under the ACA. 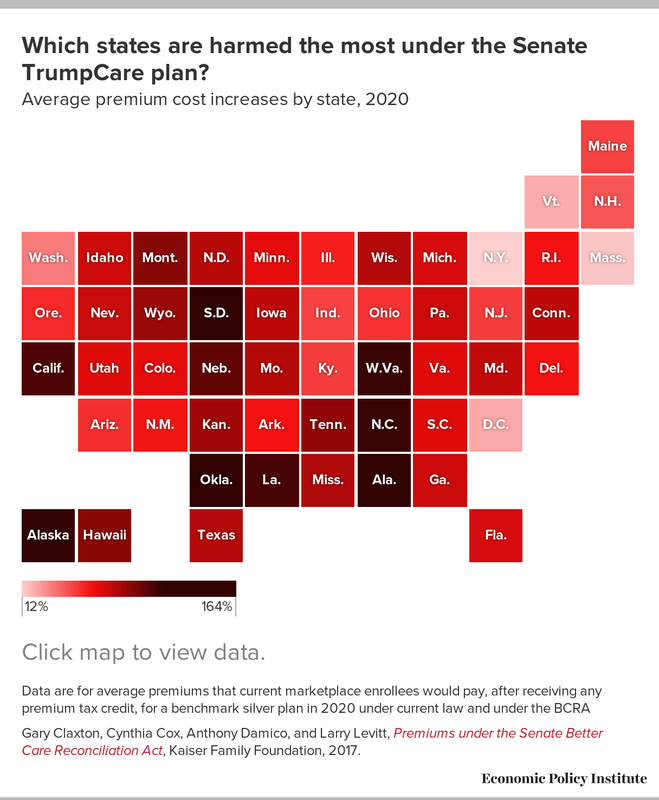 Gary Claxton, Anthony Damico, Larry Levitt, and Cynthia Cox of the Kaiser Family Foundation have estimated the increases in premiums for plans matching the extent of coverage currently available under ‘silver’ plans for the year 2020. To focus on the impact on family budgets, they report premium amounts after the tax credits that subsidize purchases of health insurance are accounted for. Kaiser researchers found that marketplace enrollees would pay on average 74 percent more toward the premium for a benchmark silver plan in 2020 under the BCRA than under current law. Gary Claxton, Cynthia Cox, Anthony Damico, and Larry Levitt, Premiums under the Senate Better Care Reconciliation Act, Kaiser Family Foundation, 2017. In Alabama, for example, premiums would increase 164 percent from $156 a month to $411 under the BRCA. In Alaska, they would increase 142 percent from $334 a month to $802 a month. The reductions in premium subsidies, in concert with tax cuts for the wealthy, will cost Americans jobs as well. Because low- and moderate-income households tend to spend a much higher share of their disposable income, the overall effect of the BCRA would be less spending and lower aggregate demand across every state and congressional district. This pain is highly unequal in its distribution, in more ways than one: There are differences in net premium increases among the states. These results actually understate the increases in out-of-pocket costs under BCRA since they do not reflect the higher deductibles that would be imposed.